We are a friendly amateur dramatics group, based in Westbury-on-Trym, North Bristol. 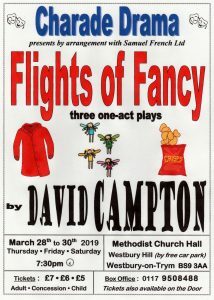 We aim to put on two productions a year; one in Spring (often a set of one-act plays) and one in Autumn (usually a full-length production and sometimes a pantomime). 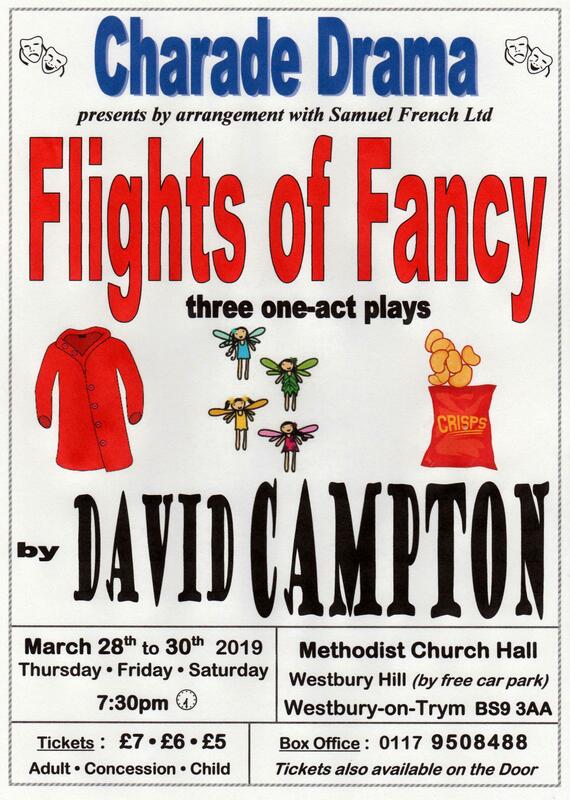 On Thursday 28th to Saturday the 30th March 2019, we are presenting three one-act plays by David Campton, where various characters embark upon a ‘flight of fancy’. Do come along and be entertained – we’d love to see you. Further details on our NEWS page. During the Summer, the group meet regularly to do play readings, maintain contact and be sociable. This gives us the opportunity to choose potential future productions and to explore plays we mightn’t be able to perform ourselves. If you would like to be notified of our future productions or, even better, want to join us, on or off stage, then please do CONTACT us. We welcome actors and directors and anyone who is interested in helping us out back-stage, front-of-house, or with costumes and scenery. We enjoy working as a team, using everyone’s abilities, wherever their talents may lie. If you’d like to give us a try, then we’d be delighted to hear from you. To see what is coming up next then please go to our NEWS page. Hope to see you at the next production!